After my calm and peaceful Friday night at the Meditation & Mindfulness Workshop, I had quite a busy and active rest of the weekend. 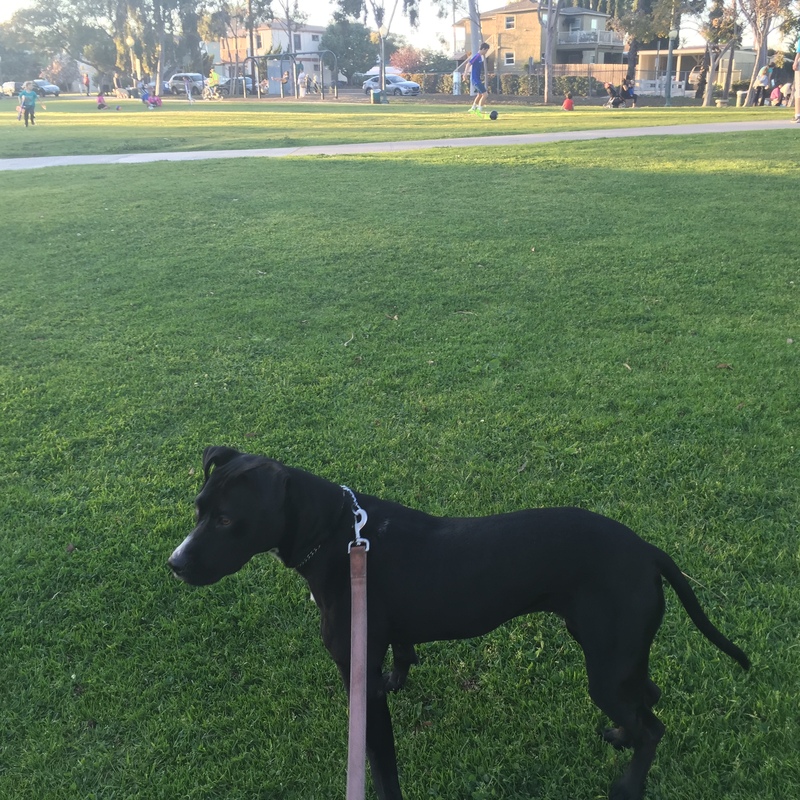 Despite my best attempts to sleep in, my body woke me up about 3 times while it was still dark and when I rolled over the 4th time to see that it was 7:30am, I decided to get up and begin the day by walking the pup. I had every intention of going to an oceanfront yoga class, but just wasn’t feeling it come Saturday morning. 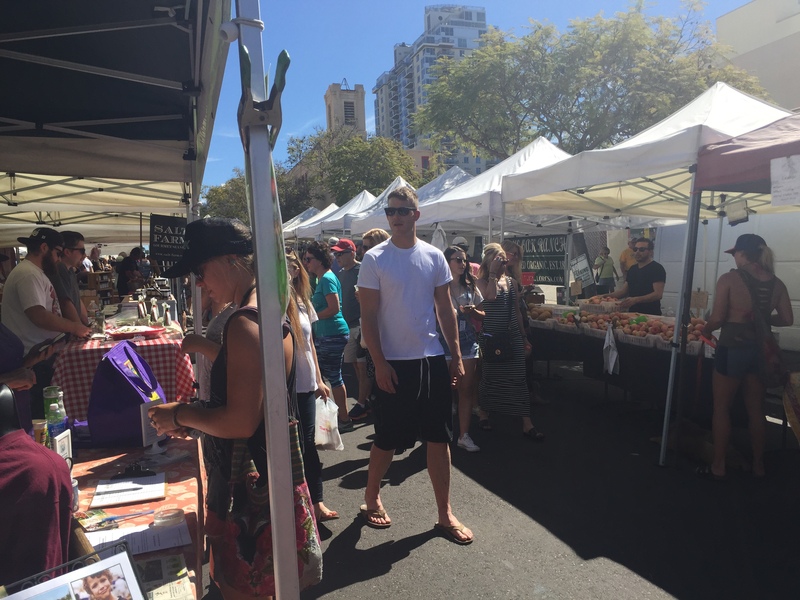 Instead, Ed and I decided to hit up the Little Italy Farmer’s Market, which is one of our favorite activities to do. It was a beautiful day and it’s always so nice to walk around downtown. 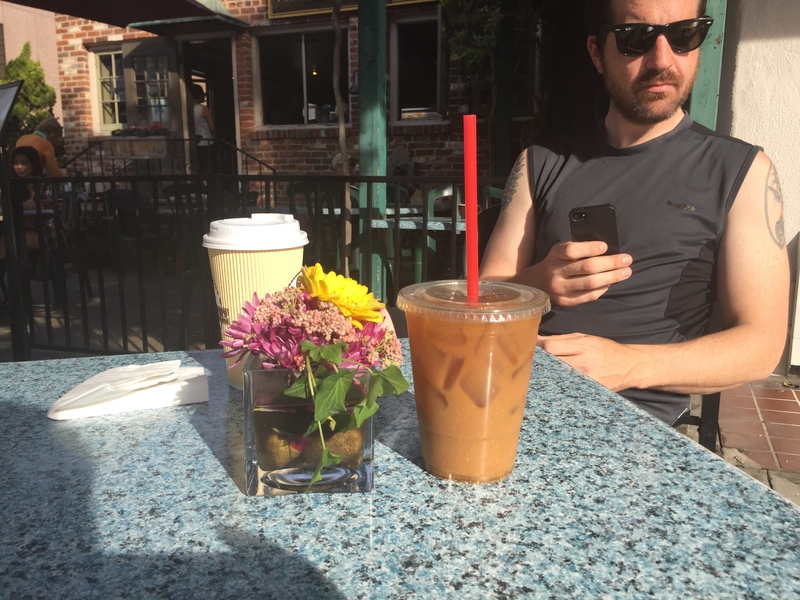 We ended up only grabbing some cold brew coffee and beets. To be honest, I’ve never really given beets a try, but I’m excited to prepare them and see how I like them! After that, we had a fun afternoon of SUP on the books! 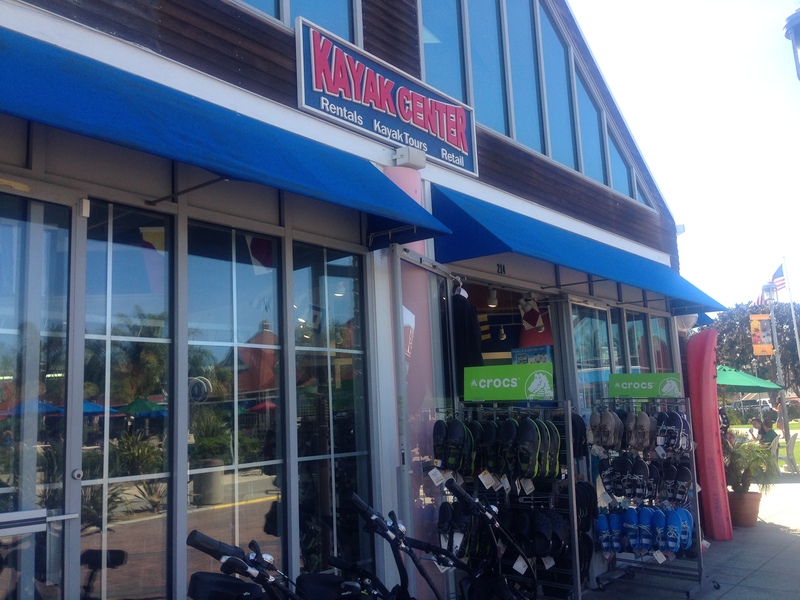 The only other time I’ve paddle boarded was in a bay, so I was pretty nervous to do it in the harbor where there are a lot more boats and waves. We reserved SUP through the Fitn, which I’m still in LOVE with. Yoga, barre, spin, Crossfit, SUP, and everything else under the sun for only $99 a month? Yes, please. 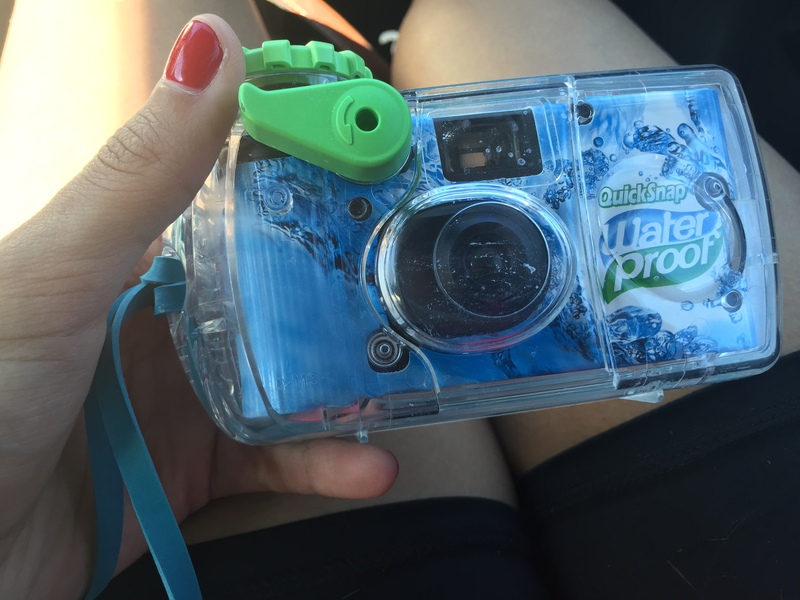 I don’t have any pics of us actually paddle boarding, but we did take a waterproof camera out with us on the water, we just have to get the photos developed. It’s been at least 7 years since I’ve had to get photos developed – it seems like such a thing of the past! 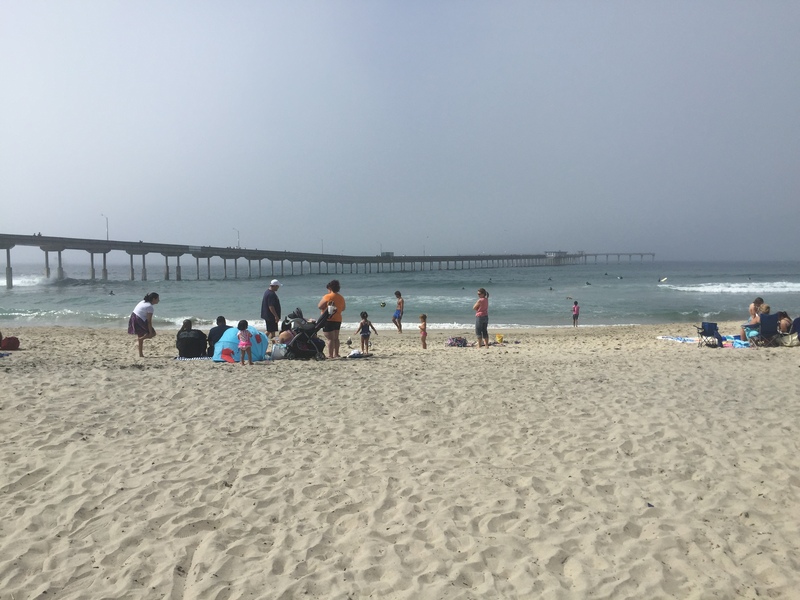 Suffice to say that I was right to be nervous about paddle boarding in the harbor since the current was pretty strong and I was thrown off my board and straight into the ocean at one point. I was pretty startled at first and upset, but I was determined to not let that ruin the experience. After paddle boarding, we went to Pacific Beach to walk around for a little bit before going home to get ready for dinner in Old Town. Ed got a new job that he starts on Monday, so we were in serious celebration mode! I seriously LOVE Old Town. The energy there is so amazing. While we were waiting for our table for dinner, we watched the band that was playing and the cutest older couple dancing to the music. Their dance skills were ON POINT and I hope to have half of their energy when I’m their age. Dinner was fantastic. We ate ALL.THE.CHIPS. Seriously though, all of them – the waitress came back to ask if we wanted more to which we reluctantly said no. 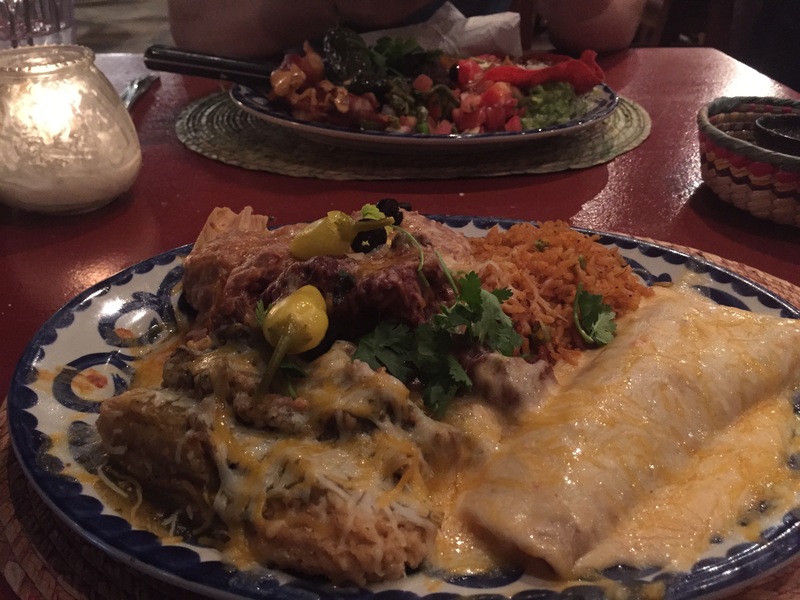 I ordered a bit of everything for my dish – one beef tamale, one pork tamale and one chicken enchilada. I couldn’t finish it all because I was so full of chips, so I was pretty disappointed in myself. It was a great night of celebrating! On Sunday, we were determined to have a relaxing day once we got our errands out of the way. 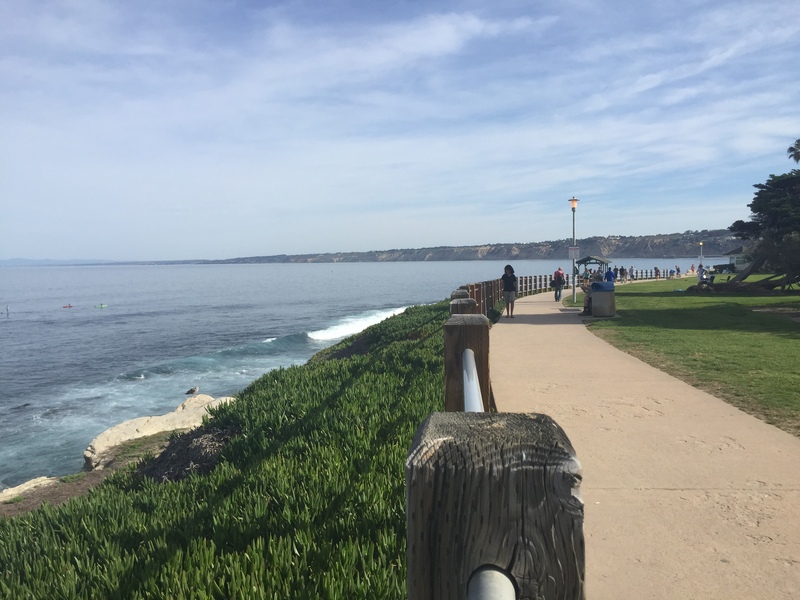 After our 8:15am spin class, we decided to grab coffee and walk down to La Jolla Cove. Perfect way to start a Sunday. After that, we came home to make breakfast before heading to TJ’s and Sprouts to do groceries for the week. 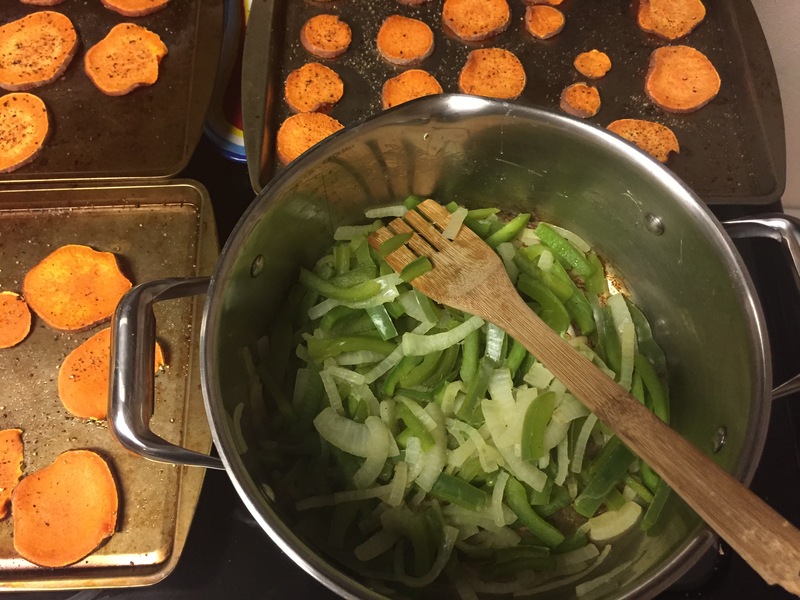 The rest of Sunday consisted of meal prep. Look at all of that chicken! 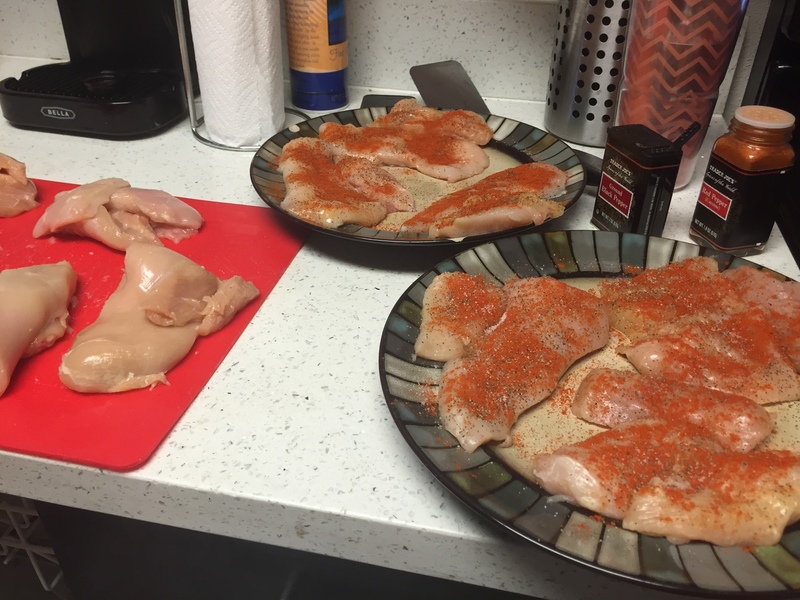 I promise there is an explanation for why we bought 10 pounds of chicken for 2 people, which I will explain later this week. After that, we parked our butts on the couch to catch up on the past couple episodes of The Walking Dead! Ever tried SUP or kayaking? Which do you prefer? That’s a tough question, but when I’m in the mood for more of a physical challenge, I prefer SUP. When I want to just relax and zone out, kayaking all the way. For years now, I’ve read about the numerous benefits of meditation. The list goes on and on and includes everything from stress relief to better sleep to improved digestion to lower blood pressure. Over the past couple of years, I’ve attempted to meditate on my own a few times and even downloaded a couple of guided meditation apps to help with the process. After a few times of trying, I quickly resigned to the fact that my mind is just not calm enough to sit there and think about “nothing”, so I would give up. Recently (mainly since our move to San Diego), I’ve found myself getting stressed out very easily, focusing on the negative in every situation, and being extra snippy at the littlest things. Truthfully, I have no idea why I’m acting or feeling this way. Things have been going pretty well since we’ve moved to San Diego and, while I do miss my friends and family, I am happy with my decision overall and where it’s taken me, so I’m not quite sure what’s going on in that brain of mine. 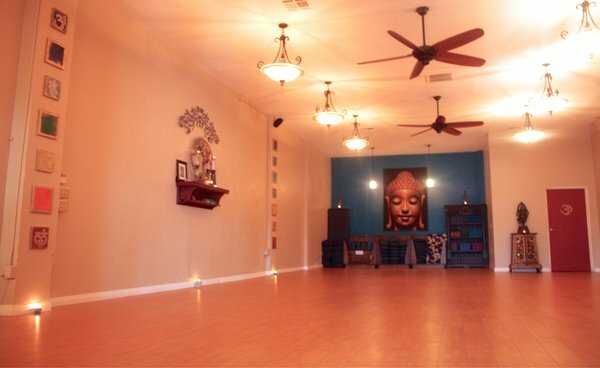 After my Chakra Flow class at Happy U Namaste last Sunday, I saw that they were holding a Meditation & Mindfulness Workshop on Friday and decided to sign up for it. I’m pretty open to anything that may get me out of my rut at this point. 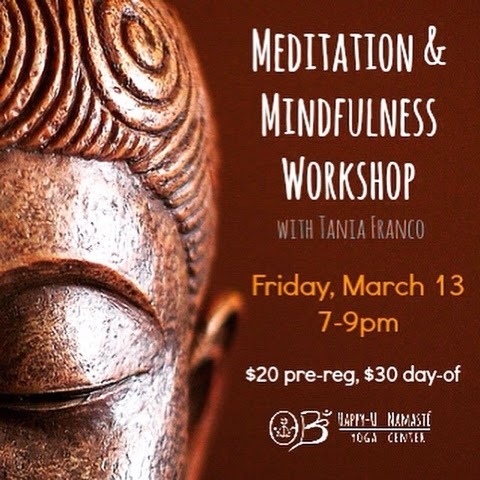 The class consisted of about 20 other people and the instructor, Tania Franco, is a Clinical Psychologist and Mindfulness Guide. We began the class by going around the room and saying one word that encompassed what we hoped to gain from the 2 hour workshop. Everyone’s answers varied from things like happiness to peace to serenity to joy. My word of choice was “acceptance” – acceptance for myself, for where I’m going and where I’m at, for other people, etc. After this, she went over a few different types of meditation and how they work well for different kinds of people. One of the main things I took from her was that meditation is not a one size fits all thing. Some people like to meditate sitting up, while others like to lay down. Some like to think of a mantra and others like to focus on breathing or listen to music. It’s even possible to meditate while walking or driving (to an extent, of course). She also stated that meditating does not mean that your mind is entirely free from thoughts like most people think. It’s impossible to completely clear your mind of any thought and you just have to focus on bringing your mind back to what you’re doing in the moment when it does inevitably wander. Even if you have other thoughts, it doesn’t mean that you’re not getting the benefits of the exercise. 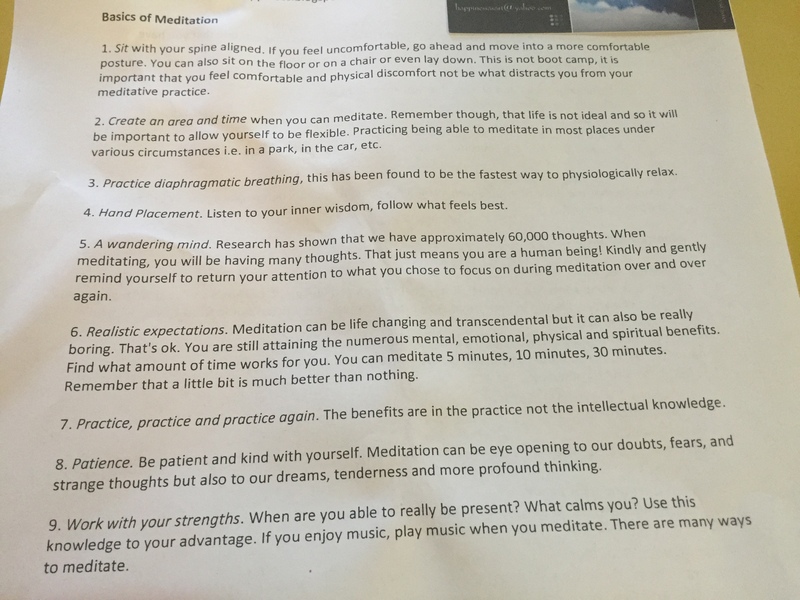 After the overview, we went through a few different kinds of meditation. 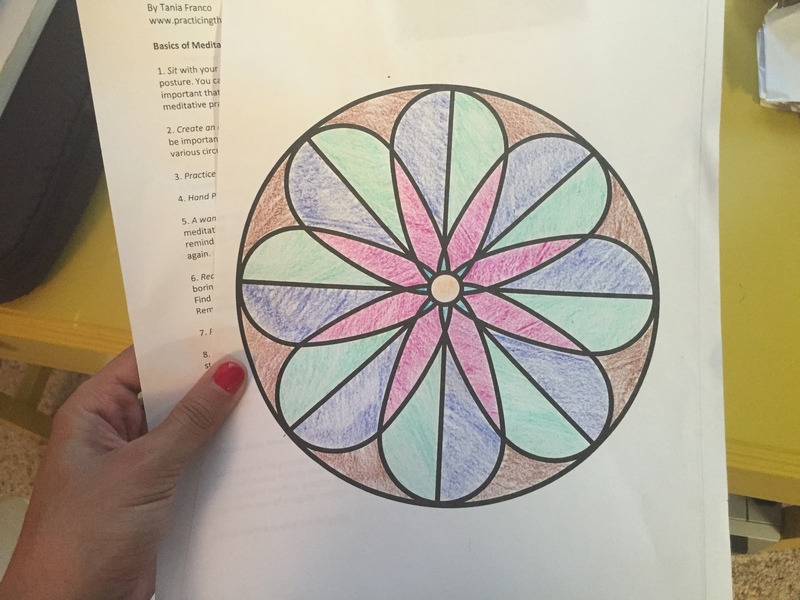 The first one involved coloring a mandala. We each got a paper and crayons and were instructed to just focus on the exercise for 15 minutes. At first, I found it to be kind of nice to be coloring. I mean, how often do we as adults use our time to do something like that? Almost never. After about half of the time elapsed though, I started to get stressed that I wouldn’t finish it in time. I knew it would irritate me if I couldn’t finish the whole thing, so I began to quicken my strokes so I could get it done. I quickly noticed that finishing was not the point of the exercise and it’s typical of me to make a stressful situation out of something that totally shouldn’t be. After I realized what I was doing, I tried to bring myself back into the exercise and what the real purpose of it was. The next meditation focused on color also, but in a different way. After getting into a comfortable position, we closed our eyes and took stock of how our body was feeling at the moment and noticed if any particular body parts were calling out to us at the time. For me, it was my lower back. After that, we associated a color with that particular body part and for about 10 minutes focused on that color and noticed how it evolved during the time we were thinking about it. My orange faded into a purple color and eventually became a mixture of a bunch of different colors. During this exercise, it was the first time I could feel my mind actually doing what I typically think of as “meditation”. It was free from other thoughts and calm and I was able to really focus on the color. It sort of felt like an out of body experience. Really awesome and relaxing. The last meditation was a “forgiveness” meditation, and I found this one to be the most difficult. We began by thinking of someone who was easy to love, things we liked about this person, and sending them wishes. After this, we did the same thing, but for someone who we found “difficult to love”. And on the third round, we did the same but thought of ourselves. I found myself feeling guilty when thinking of the “difficult to love” person and was overcome with sadness, which I really didn’t expect. At the end of the exercise, we envisioned the three of us together in a circle and mentally envisioned that circle of people coming together to spread love and kindness to the rest of the world. We ended class by going around the room and saying how we felt after the class. Again, everyone had different answers that ranged from enlightened to serene to accepted to happy. My word was “open”. Overall, I feel like I learned a lot from the workshop and feel like I can really start applying it to my everyday life now that I know that meditation doesn’t have to be so cut and dry. I can still get the benefits of it even if I don’t fully tune out or even if I do feel a little stressed during it. Coincidentally, Deepak Chopra and Oprah are hosting a 21 Day Meditation Experience that begins today, so I signed up for it and really hope to complete the whole thing. I’ve applied what I’ve learned over the past few days and, even though I’m not perfect at it, I do think it is helping me in some ways. If you’re interested, you should sign up too and then we can complete it together! Have you ever tried meditation or do you practice regularly? What’s your go to method for coping with stress? 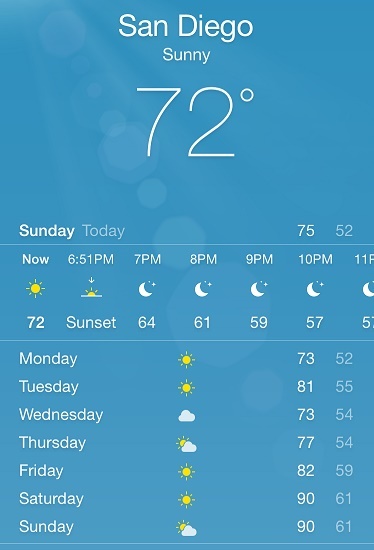 I’m pretty sure all of you east coasters are going to hate me for saying this, but I’m pretty sure that Spring has officially hit San Diego. Yesterday, we received temps well into the 80s and the rest of the week is looking sunny and 70 degrees or above. I can’t say that I’m hating it. I’m also super excited that Daylight Savings Time has hit. I don’t know about you guys, but I really hate that by the time I leave work each day the sun is already setting. The day seems longer when the sun doesn’t set quite so early. To celebrate the Spring-like temps, I had a pretty active weekend starting with a Sparkcycle class on Saturday morning, which is similar in energy/workout to SoulCycle or Flywheel (i.e. LED lights and loud, club-like music). I told you guys about the Fitn app before (which is similar to ClassPass and Fitmob) and I am still in love with it. It lets me access great classes all over San Diego like Sparkcycle for only $99 a month, which is a steal for boutique-style studios. 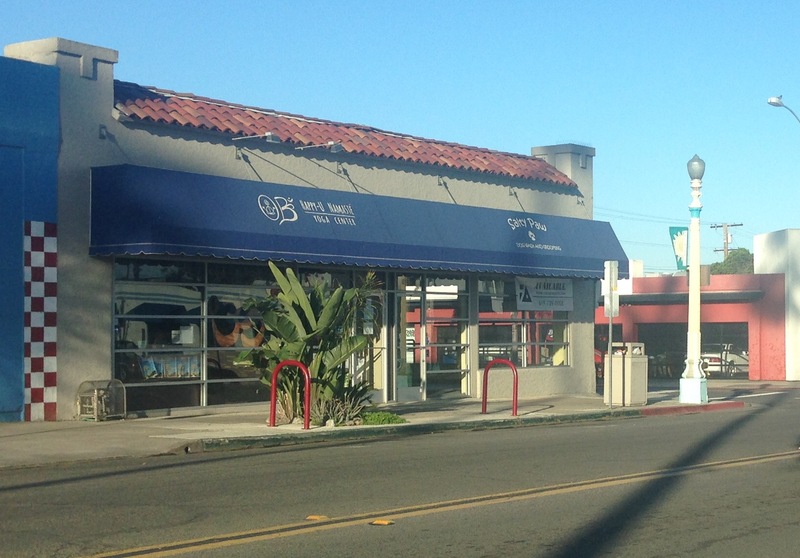 I started Sunday off with a yoga class at Happy U Namaste (also through Fitn) in Ocean Beach. The Sunday morning 9am class is a Chakra Flow class. It was super low intensity and very peaceful and centering, which was the PERFECT way to start out my Sunday. The whole class focused on the root chakra, which involved connecting ourselves with the earth and material world while also focusing on stability and security. After yoga, I had to head to work for a couple of hours to help out with a Nutrition Seminar we were hosting. I love that I get to work in the health and fitness field and don’t even mind going to work on a Sunday since it hardly feels like “work” when it’s something I’m so passionate about. After the seminar, I headed back over to OB to met Ed, who was studying at a café there after he finished his yoga class. We walked about OB for a little while since it was such a nice day before deciding to head to Old Town to check out some of the cool shops. 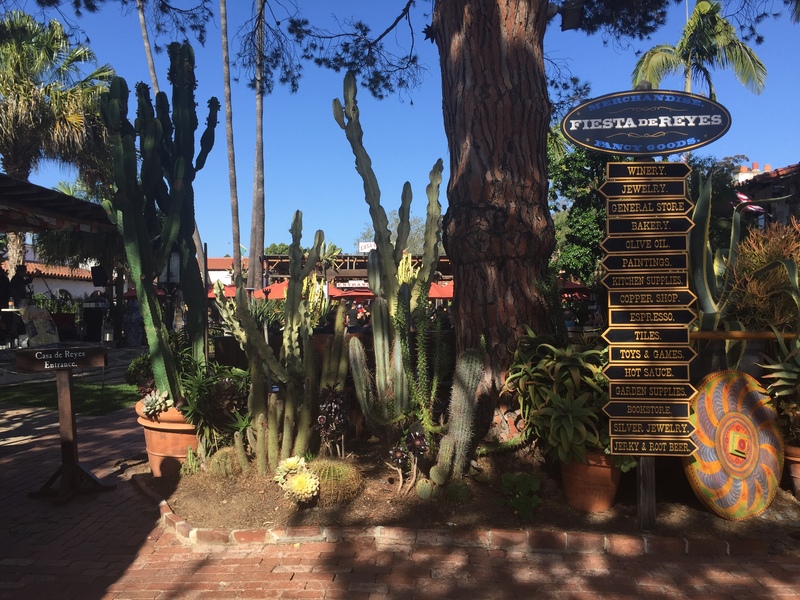 Old Town is basically like “Little Mexico” and has the most amazing restaurants, cute little shops, and live music everywhere. Even though I’m very sad that I couldn’t partake in all of the margarita drinking and tamale eating since I’m still trying to eat clean, it was still fun to walk around on such a beautiful day. After a fun-filled day, we hit up TJ’s and Sprouts for our weekly groceries then did meal prep for the week before planting our butts on the couch with Netflix for the rest of the night. What are the temps like where you live? Fave type of food? American, Mexican, Italian, Japanese, Thai, etc? ALL OF THE ABOVE.